My great-grandma is turning 100 years old this weekend, and we're having a veritable family reunion to celebrate. Aunts and uncles and cousins coming in from everywhere from California to Maryland, and Utah, Wyoming, Indiana, Kentucky, Illinois, and who knows where else. It will be lots of fun. Hooray for families! 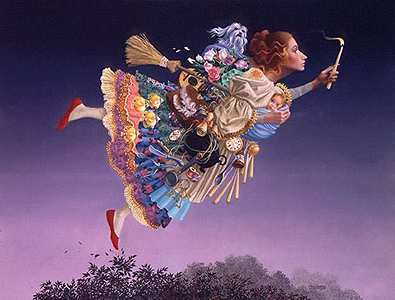 Anyway, I'm off for three days of fun, family, and flying! Oh, and friends, too! I'll be stopping by to visit friends from college who live in the area. You know, it's nice to be older than 25 and not have to pay the "young driver" surcharge when you rent a car anymore! 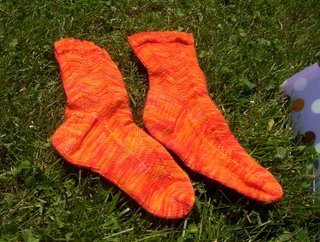 Here are the socks all together. They're not too bad, I don't think. 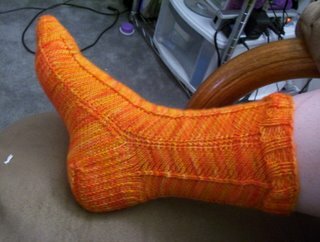 I was worried about them being tight around the heel when trying to put them on, but it's actually okay. To be honest, they're kind of slouchy. 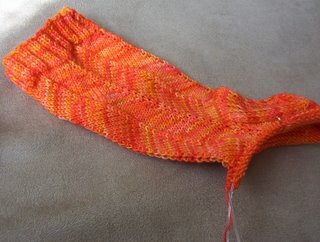 I probably should have either cast on fewer rib stitches at the cuff, or knit on smaller needles for the ribbing, or both. But oh, well. I think my sister K will like them. I bought it on e-bay from this store. 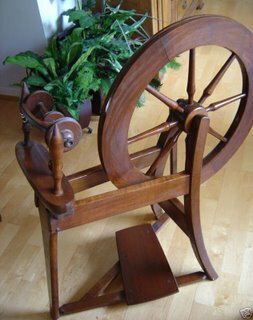 It wasn't expensive, and probably not as high quality as these spindles, but I didn't really want to pay much since I wasn't sure I'd even like spinning. So far it's kind of fun. 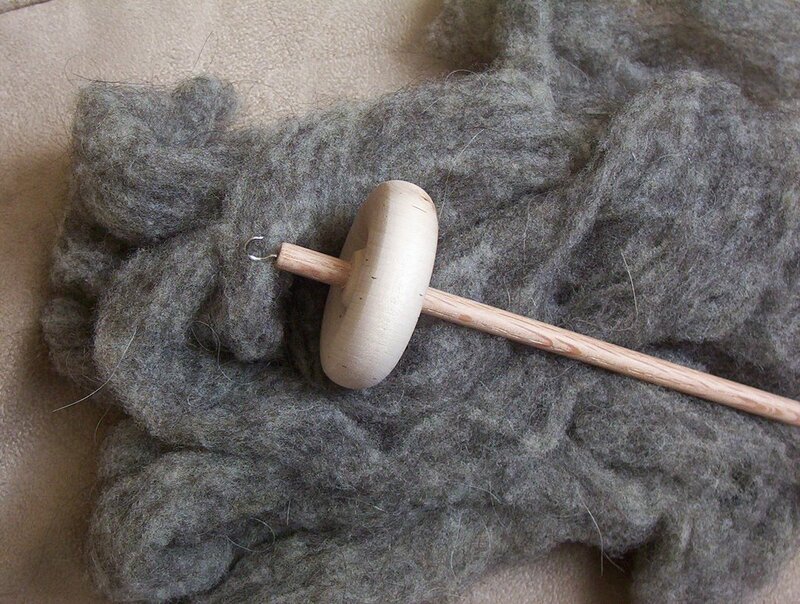 The spindle doesn't spin for very long, but that's okay for now. Once I get better, I'll probably want either a nicer spindle or a wheel. I saw one the other day advertised online--it's very pretty. I like that it's sleek and smooth and classy, but still rather traditional-looking. Hmm...maybe someday. I had a half day off of work again today (meaning I have to work on Saturday). So far, I've spent a couple of hours watching part of the BBC/A&E Pride and Prejudice movie (it's one of my favorites!) and working on my sister's socks. 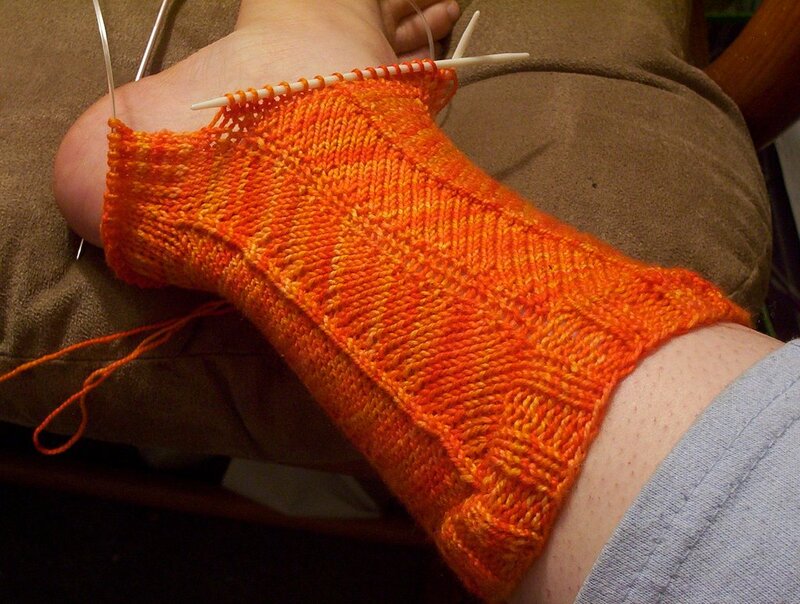 I've turned the heel on the second sock. I found this yarn at a discount store a few months ago, and I wanted to try some self-striping yarn, but I'm not such a fan. It's superwash wool, I think (I've managed to misplace the band), but it's really stiff and scratchy compared to the Koigu I've been working with. I started some toe-up Jaywalkers, because I think I'd be really bored with just a plain stockinette or ribbed sock, but I'm just not really feelin' the love. Might rip it back and do it plain anyway. Just to get it out of my stash. 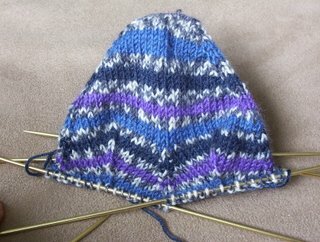 What I really want to work with is THIS: Artyarns Ultramerino #106. YUM! I love the greens and purples together. It's soft, too. 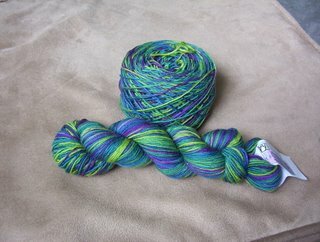 I guess I'm more of a yarn snob than I EVER EVER realized! I really should go and do my laundry, since I have a day off...but who wants to do chores? Here it is--One Jaywalker done. I really ought to cast on for the second one, but I'm not going to. It's late and I need to go to bed. No news on the new apartment yet. I went in and looked at it last week. My managers haven't told me when I can move in, but they said something about wanting to re-paint it first. I can handle that. This pair of socks is going so fast! Check it out: (sorry about the bad picture, it was taken at night). I'm worried that they're a little tight coming around the ankle, but we'll see. Maybe blocking will help. 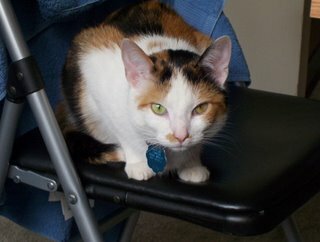 I've added a link over in the sidebar to a page of "Things About Me". Eventually, it will get to 100. But we're not there yet.